Jars of creek water, taken as samples from local creeks, form a window of water, part of artist Stacy Levy's Watershed Pantry work at the Projective Eye Gallery at UNC Charlotte Center City. Historic photos, maps exhibit, through Dec. 31. The Charlotte Museum of History, 3500 Shamrock Drive, offers a collection of historic photos and maps of Charlotte creeks. More information: CharlotteMuseum.org and PlanCharlotte.org. A new film by the smARTlab’s Ben Premeaux documents the work of the artists involved in the KEEPING WATCH on WATER project: photographer Nancy Pierce, visual artists Stacy Levy and Lauren Rosenthal and filmmaker Marek Ranis. Where: UNC Charlotte Center City, 320 E. Ninth St.
Works by artists Lauren Rosenthal, Stacy Levy, Marek Ranis, Nancy Pierce, and Ben Premeaux explore our waterways in diverse media and from a range of perspectives – geographic, scientific, aesthetic, and spiritual. A vast and elegant cut-paper map by Rosenthal, Mecklenburg Creek Drawing, shows the entire watershed of Mecklenburg County. Levy’s Watershed Pantry exhibits jars of water from local creeks. Stunning photography by Pierce documents the beauties and the troubles of our massive creek system. Stewardship, a video installation by Ranis, with Tina Katsanos, examines how religious beliefs define our perceptions and actions toward the natural environment. A lobby installation features a film by Premeaux ‘Almost worthless if it’s polluted,’ plus video memories from Charlotteans about the role the creeks have played. April 18, 9 a.m.-12 p.m.: Briar Creek clean-up, sponsored by Catawba Riverkeeper Foundation. Meet at Mint Museum, 2730 Randolph Road, Charlotte For more information 704-679-9494 or sam@catawbariverkeeper.org. Please register at this link, to be notified in case the event is postponed due to rain. April 25: 10-11 a.m. Explore the unnamed creek through UNC Charlotte Botanical Gardens. Walk highlights efforts to protect and restore stream. Meet at greenhouse at Craver and Mary Alexander roads. Information: mlizotte@uncc.edu. 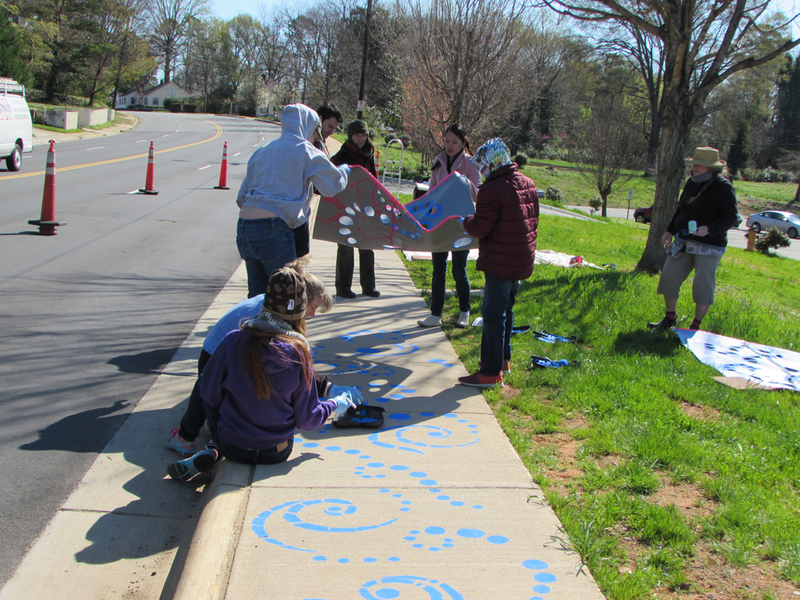 May 2: 9-11:30 a.m. Meet at Parkwood Avenue and North Davidson Street. Walk ends at 12th Street. Walk along the greenway or hop in the creek with wading boots, and help clean up trash. This event is part of the Great American Cleanup, a nationwide series of cleanup and community beautification events March 1-May 31, and is organized by Keep Charlotte Beautiful and Keep Mecklenburg Beautiful. Walk leader: Scott Adams. More information here. Or email kcb@charmeck.org.Co-sponsored with Jane’s Walk Charlotte. May 2: 9:30 a.m. Meet at the ground floor entrance to the Target parking deck off Charlottetowne Avenue. Hear landscape architect Beth Poovey of LandDesign discuss the greenway from Seventh Street to Morehead Street. Co-sponsored with Jane’s Walk Charlotte. Volunteers help install artist Stacy Levy’s Passage of Rain arts and education project in Revolution Park neighborhood the weekend of March 28-29. Photo: Charlotte-Mecklenburg Storm Water Services. May 2: 10:30 a.m. Meet at Clanton Pavilion, 3132 Manchester Dr., end at Revolution Park Sports Academy, 1225 Remount Rd. Explore artist Stacy Levy’s Passage of Rain installation with the artist and with Revolution Park neighborhood leader John Howard, City of Charlotte’s historic district administrator. Stacy Levy’s installation in west Charlotte’s Revolution Park neighborhood reveals the path of rain and runoff along a .8-mile stretch, from street to storm drain to stream to a final destination in Irwin Creek. Volunteers installed it March 28-29, project will be on-site for two years. Co-sponsored with Jane’s Walk Charlotte. May 3: 2 p.m. Meet at Freedom Park near the East Boulevard park entrance. Walk upstream toward Morehead Street, as walk leader Olivia Edwards. environmental supervisor with Charlotte-Mecklenburg Storm Water Services explores the fish and bugs of Little Sugar Creek. Learn now aquatic organisms have been affected by changes in the city through the years. Co-sponsored with Jane’s Walk Charlotte. May 16: 9:30 a.m. Meet at the Fran’s Boys & Girls Club, 2600 W Trade Street. Walk beside Stewart Creek through Biddleville-Smallwood, learn about plans to help water quality and lessen flooding. Co-sponsored with Jane’s Walk Charlotte. June. Explore north Mecklenburg’s McDowell Creek on foot or with paddles. Event cancelled.. PLEASE NOTE: The area around the UNC Charlotte Center City building is under construction. Ninth Street is closed to through traffic between North College and North Brevard streets. North Brevard Street may be accessed via 11th or 12th streets. Visit this page regularly for driving and parking updates. “Dirty Martini” Film Screenings: Enjoy martinis and hors d’oeuvres with local ingredients at our 6 p.m. pre-screening receptions. A panel discussion with each film will explore topics related to KEEPING WATCH on WATER. Paid “event parking” is available at UNC Charlotte Center City lots, shown in yellow on this map. FRIDAY, MAY 1, 6 P.M. Films: ‘Almost Worthless If It’s Polluted’ documentary from Charlotte filmmaker Ben Premeaux and the smARTlab, Watermark, a documentary from Jennifer Baichwal and Edward Burtynsky, exploring the human relationship with water. Panel discussion will examine local issues and arts related to surface waters. Where: UNC Charlotte Center City. No registration required. PREVIOUS EVENT THURSDAY, APRIL 9, 6 P.M. The April 9 event was co-sponsored with the Integrated Network for Social Sustainability. Passage of Rain: How do you learn where rain goes after it falls from the sky and onto the sidewalk or street? Stacy Levy’s installation in west Charlotte’s Revolution Park neighborhood reveals the path of rain and runoff along a .8-mile stretch, from street to storm drain to stream to a final destination in Irwin Creek. Volunteers installed March 27-28, project will be on-site for two years. Home Basin: Charlotte / An Interactive Guide to Urban Creeksheds: Detailed story maps of Mecklenburg County creeks and streams by Lauren Rosenthal give residents a way to identify with and investigate their home creekshed. Viewers are invited to submit their own stories and photos.